Time for baby naming advice: spelling counts edition. 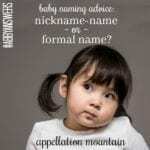 Yup, after a quiet summer, Abby Answers: Your Most Pressing Baby Naming Dilemmas, Resolved is back! We’re talking about the decisions that vex parents during the naming process. They’re the ones debated on baby naming forums, discussed around the kitchen table, argued over text with our friends. 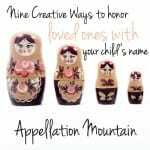 Today we’re talking about a favorite of mine: now that you’ve found a favorite name, how should you spell it? Confession: I used to be one of those spell-it-right types. But the more I learned about all things onomastic, the more I realized a hard truth: there’s really no such thing as a correct spelling for the overwhelming majority of names. All of that means that I think there are good reasons to choose non-standard, slightly outside the mainstream spellings. And I think it’s pretty tough to argue that there are correct and unchanging spellings that must be used! Zoe long stood at the most popular spelling of the name. But today, it sits at #41 – compared to Zoey at #29. The traditional Madeline comes in at #100. But you’re more likely to meet a Madelyn, since that spelling ranks #63. Aiden stands at very popular #17, while Aidan has plummeted to #221. For years, the opposite was true. While we’re on the -aiden names, #26 Jayden long lagged behind Jaden. But the ‘y’ spellings are preferred, for both Jayden and Brayden today. Grayson and Greyson for boys. There’s also Jackson, Jaxon, and Jaxson. We have two versions of Ariana in the Top 100, too – there’s also Arianna. Expand the list to the Top 250 or even Top 1000, and spelling choices abound! To some this might feel chaotic, even problematic. But standardized spellings are relatively novel, and many of these variations have history aplenty. If it’s impossible to settle on a correct spelling, what’s a parent to do? Visit the United States Social Security Administration’s baby names center if you’d like to look into your favorite names’ spellings. It might take some digging, but you can likely figure out which spelling is dominant – most common, at least at this moment in time. If you don’t have a strong feeling about spelling, simply use the dominant one. What’s your take on the topic? 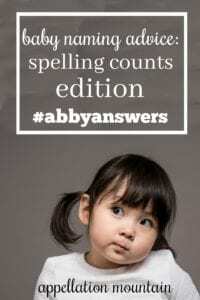 Have you ever struggled to choose a spelling for a favorite name? Are there certain names that you like only if they’re spelled one specific way? 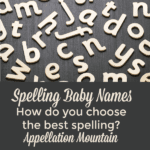 I generally prefer the more dominant spelling of names, but seeing as my husband has the name Johnathan which is the variant spelling it won’t surprise me if he wants some of our kids to have the variant spelling too. I’m a stickler for ‘standard’ spellings. But my husband and I love the name Maya, which has several spellings. The problem, however, is that we would pronounce it may-uh, not my-uh. What do people think about this? I think you’d probably get a lot of confusion over it; most people would naturally pronounce it my-uh. The problem is, I’m not sure there is a spelling that better emphasizes your desired pronunciation. Maeya? Meia? But those spellings are almost more unique than the pronunciation. I’m sorry I couldn’t be more help. For what it’s worth, the people you associate with most often would get the hang of saying may-uh fairly quickly, especially if they hear it spoken before they see it written. So if you did name a daughter Maya like may-uh, I think it wouldn’t be too much of a pain in the end if you really love the name. As someone who lives in a pretty deep Maya pocket, I think the may-uh versus my-uh pronunciation would be a real challenge. This doesn’t mean you shouldn’t use the name and pronunciation you love, but you should be aware that near 100% of people you meet will assume it’s my-uh, again and again and again. Many will get on board with your preferred pronunciation, but if endlessly correcting people feels like something that would be a drag for you (and more importantly for your daughter), I’d rethink. As someone who lives in a pretty deep Maya pocket, I think you’d be fighting an uphill battle with a non-traditional pronunciation to a name that almost 100% of people will see as my-uh. Most people you know would get on board after they knew, but you’d have to be ready to correct people again and again and again in all sorts of situations. If this feels like it would be a drag, especially to your daughter who will have the name her entire life, I’d rethink. Because of the civilization, “Maya” as “”May-uh” is going to be an uphill battle. I’m not sure how to reconcile being a stickler for correct spelling with wanting a nonstandard pronunciation. I think your best bet would be an unusual spelling that almost forces the pronunciation question- Maea, Meia, Meya, perhaps. I like Meya best. That typed a bit more snarky than the thought, apologies. But I think Maya would be a mistake your child would have to correct every time someone new read her name. I’d go with Meia, or Meya, if you want the may-uh pronunciation. Otherwise she will constantly be correcting people who say My-uh. My name is Bria, pronounced Bry-ah, and my whole life (35 yrs) everyone has read my name as Bree-ah because they assume the i is pronounced like in Brianna rather than in Brian. I’ve been correcting people since I was little, but it gets tiresome. I would have liked to have a more straight forward spelling. The most respectable reason to use a spelling variant, in my opinion, is if it is a family name or honor name. We stuck with Franceszka for that reason, although I much prefer the standard Francesca, for the middle name of one of our daughters. I really love Vilate Kimball, whose name was misspelled by someone and her mom just went along with it. If I had named a daughter after her, I would have kept the Vilate spelling although I much prefer the Violet spelling. I was very happy that my MIL had the “ie” spelling, Beckie, because I like it a lot more than the Becky version and we used her name as an honor middle for one of our daughters. With honor names, I stick with the spelling of the honoree for the most part. That being said, if Harriet Tubman’s name was spelled Harriett or Harriette, I would still have used the Harriet spelling for my daughter because I like it that much better (and all three are standard spellings!). I guess what I’m saying is that while, generally speaking, I prefer the most traditional spelling (Aidan over Aiden always), sometimes there are reasons to go with a different spelling. Is KVIIIlyn a genuine example, or pure illustrative invention? I have come across a couple of kids named “L-A”, pronounced Ladasha. A step too far. Have you really come across L-a / Le-a ‘Ledasha’s? Because generally that’s repeated as a racist tale without any proof in fact. Check Snopes. I’ve not met any, but told of some being seen in hospital by friends working there. Maybe it is a perpetuated racist myth then, hadn’t heard that. There are some truly awful names definitely used though! Katharine Hepburn presumably felt a little burdened by the spelling of her name. I imagine she had to spell it quite a bit. It was, in fact, misspelled in the opening credits of the film ‘State of the Union’ as Katherine. Is it really misspelled in the credits? I never knew that! I do love the spelling Katharine, and I know someone named for Hepburn, with that exact spelling. I’m not sure if it comes up often, because she’s usually known as Katie or Kate. Just went to the Internet Movie Database (imdb.com) to check this and YES– it is misspelled in the credits– but they did get it right on the movie poster. (go figure) Here is the explanation offered by IMDB but I am still confused. Katharine Hepburn, Adolphe Menjou and George J. Folsey’s names are misspelled in the opening credits because the distribution rights were originally owned by MGM, but only for seven years. The rights were then sold to another company, which had to create its own opening credits. The year I was born, the dominant variant of my name – Lauren- ranked #24 and my variant -Loren- ranked #699 for girls and #396 for boys. Having the obscure alternative spelling still makes me feel weird (rather than special and unique). I share my name with others absolutely everywhere I go, and it’s not helpful that it looks different in writing. I would have much rather had a name that actually sounded different than a top-25 name so I wouldn’t constantly run into the other 20,000+ born per year in the 1980s & 90s. If I had to have this super common name, I would have rather had the popular spelling that everyone automatically assumes. I suppose the calculus would be different if both versions were top-100 and relatively similar in numbers. I do think that’s a VERY good point. If parents are after a name that is different, spelling alone isn’t enough to accomplish that goal. I have a Clare named after St. Clare of Assisi. We really struggled when naming our 2nd daughter whom we wanted to call Kate. I wanted Katherine but nearly all the saints are spelled Catherine. My husband wanted the name to be spelled the same as the saint’s name. Luckily we learned about St. Katharine Drexel. So we compromised with Katharine. I love the spelling now but do worry about spelling hassles down the road for her as people aren’t expecting that spelling. I also loved Theresa and had we had another girl I would have wanted to use that spelling even if the two Saint Teresa’s both don’t include the “h”. There is Bl. Theresa Gerhardinger. She founded the School SIsters of Notre Dame. Her main belief was if you furthered the education of women, they will further society. Eh. I’m a Kimberley rather than Kimberly, and really, it’s never been a big deal. Husband and I had a rather drawn out argument about Vivien and Vivian (Vivienne fell first in initial skirmishes) and ultimately the ranking + ongoing higher rankings served as tie-breaker… but I still like Vivien. My favourite spelling of Katharine is as so, but it’s the least popular compared to Catherine/Katherine and maybe Kathryn too.